Oh..I’ve been waiting for a very long time to write this post. And when I say a long time…I mean years! As you know, I am not much of a runner and have actually spent most of my life really hating running and never thinking it was something I could do. So years ago when the idea of running a marathon entered my mind, it was a bit crazy and far from reality. I am a person that likes to set goals and work really hard to achieve them, but a marathon was a bit different for me. It wasn’t something I could study really hard for or work extra hours, it was something that required that I take myself out of my comfort zone and do something that only I was responsible for achieving. While there was much studying that went on and quite a few extra hours of work that went into training, it took determination and good ole’ sweat to reach this goal. This time last year I was struggling to finish a 5k, but with some planning and focus on overall physical health, I slowly upped my miles. From 5k, to a 10k and then to running 2 half marathons, the path was getting clearer. 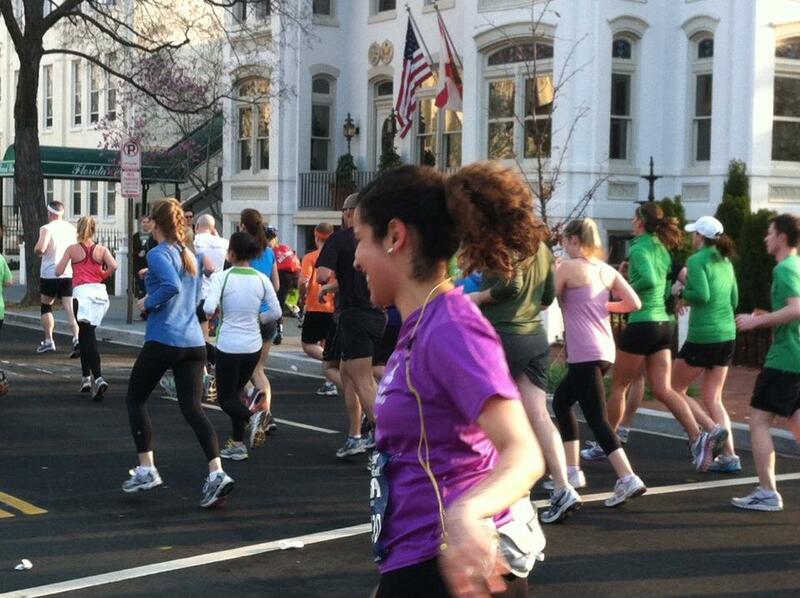 After my amazing PR during the Annapolis Half I knew the full marathon was within reach. 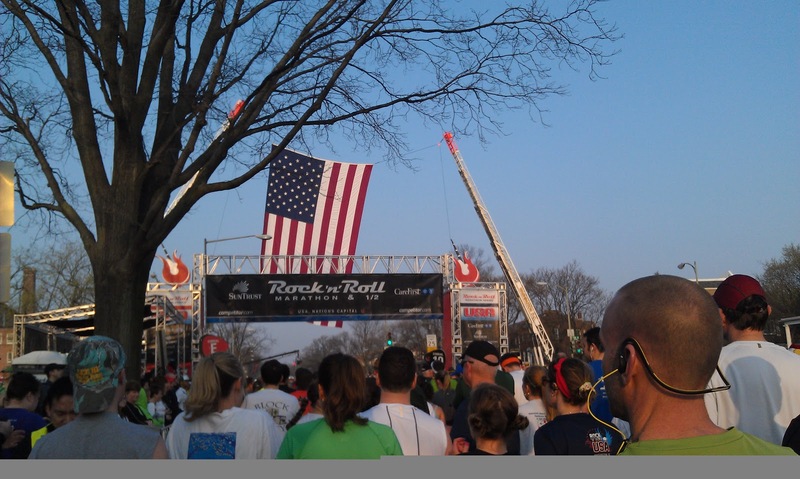 The Annapolis Half was in November and the next full marathon in the DC area was the Rock’n’Roll National Marathon. I was warned that training for a marathon during the winter could be really hard, but I didn’t want to lose the momentum I had built up and decided to go for it. So overall, I would say I got serious in my training beginning in January. 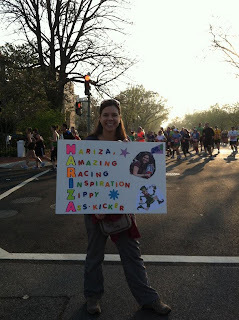 So 10 weeks later, here I am ….at the starting line of my first marathon. The race did not start until 8 am, so I was fortunate to have plenty of time in the morning to get some breakfast and spend some time on the foam roller. I hopped in my car around 6:15 am and drove to my friend’s house where it was easy to park and take the metro into RFK Stadium. The metro opened early, but I think all 20,000 of us runners got the metro at the same time! How many runners can you fit in a metro car?? Apparently hundreds! It was a snug ride! I arrived at RFK Stadium by 7:00 am and checked in with my TNT team. They had a few motivational words, but after that we were on our own. I didn’t have a bag to check, so I sat in the grass and tried to take in the moment. It was great to see all the different faces that were getting ready to embark on the same race as me, but the longer I sat there, the more nervous I was getting. The butterflies were certainly making themselves known in my tummy so I decided it was time to make my way to the corrals. All the waiting was making my nerves run high, so I tried to stretch and talk to the people around me and before I knew it, the national anthem was being sung and the first corral was let loose. They did a really good job of spacing out the corrals and leaving about 3 minutes between releases. So my group didn’t actually make it up to the starting line until around 8:15. I decided not to listen to any music for the first few miles. I wanted to hear all the lives music that makes Rock’n’Roll races so legendary, so I got my headphones ready just in case, had a brief moment of panic that I was wearing the wrong shoes and tightened and re-tightened my hydration belt and waited for the starting gun. There was a guy standing right by me as a spectator with a sign that read “only 26.2 miles to go....” Ugh..oh boy. That was the moment when I thought to myself, what did I get myself into! Finally, our corral was released and I was off! The crowd stayed pretty thick as we made our way down to East Capitol Street. I looked down at my garmin and I was clocking a 8:50 pace. WAY too fast for me. So I tried to slow down but kept finding myself trying to stay with the crowd and speeding up. I think this went on for about the first three miles. We ran by Union Station and made our way past the Washington Monument and up 14th street. 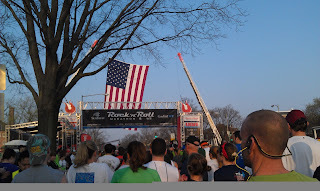 By that time, the crowd started to thin out a little bit and I was able to find a comfortable 10:00 min/mile pace. The crowds were great and music was even better! I remember thinking to myself that this is actually going to be fun! 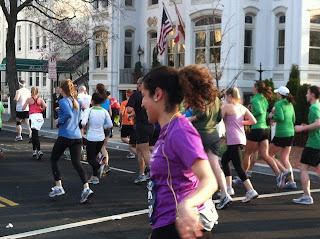 Before I knew it, we were running into DuPont Circle and the crowds got to be really heavy! There were so many people and it was so loud and crazy! I loved every minute of it. I even saw a few familiar faces among the large group of people. The biggest incline of the race was right after mile 6, so I was mentally prepared for it and told myself to slow down and not exert too much energy, but before I knew it the hill was over and we were on flat land. It was really nothing to write home about….just a little bitty hill. So onwards and upwards! The miles started to tick by, the crowds were still heavy and I was feeling great. It really felt like my legs were on cruise control and they were just going to go until I stopped them. I was conscious to stop at every water stop and Gatorade stop. The weather could not have been more perfect. It was a sunny 70 degree day, I really could not have asked for better weather. As we neared the 13 mile marker, the half marathoners spilt off and the full marathoners kept going. There were a lot of half marathoners! So once they were gone, it was wide open space for me. I was so lucky to run into my friend Beth and her husband Jason at mile 13.1 not only because I love seeing people I know in the crowds, but because she had food for me! I was HUNGRY! In my past long runs, I really didn’t have an appetite for food while I was running but this run was different, I needed food! Luckily she was prepared with the perfect fuel and filled replacement water bottles for me to speed off for the remaining 13.1 miles. The second half was much quieter than the first half. The streets were not as fan-filled and the music was spread out a bit farther. So I strapped in my headphones and put on some of my favorite tunes. Nothing like good music to get me going! The miles were passing and I was still feeling great! No aches or pains, my legs just kept cruising! Around mile 19, I found Beth and Jason again (aka “the best marathon fans ever”), got another snack and as I was leaving, she yelled “see you at the finish line!” It was hearing her say those words that made me realize that I was actually going to do this! Just 7 more miles to go! Up until this point I had stayed pretty close to the 4:25 pacer group but they pulled ahead of me after mile 19 and I just tried to keep them in my line of sight. I didn’t take any walking breaks but would slow down if my legs got tired and would pick up my speed when they felt ready. Around mile 22, I felt what some would call “hitting your wall”. My legs felt heavy, I saw people dropped out like flies, and the sun felt like it was baking me. But I kept my legs moving, dug down deep and found the strength and motivation to just keep moving. One of my TNT coaches was waiting for me at mile 25 and was so full of energy and excitement that I couldn’t help but feel that same energy. He kept saying..”you are going to do this, you are there! !” And he was right, after running a few minutes with him, I rounded a corner and saw RFK stadium, the finish line. While it still far away, the end was in sight. The last stretch of road was long, quiet and hot. I wanted so hard to run fast. I pushed and pushed and tried to get my pace under 10:00. I reached for every ounce of energy I still had and used every bit of it. 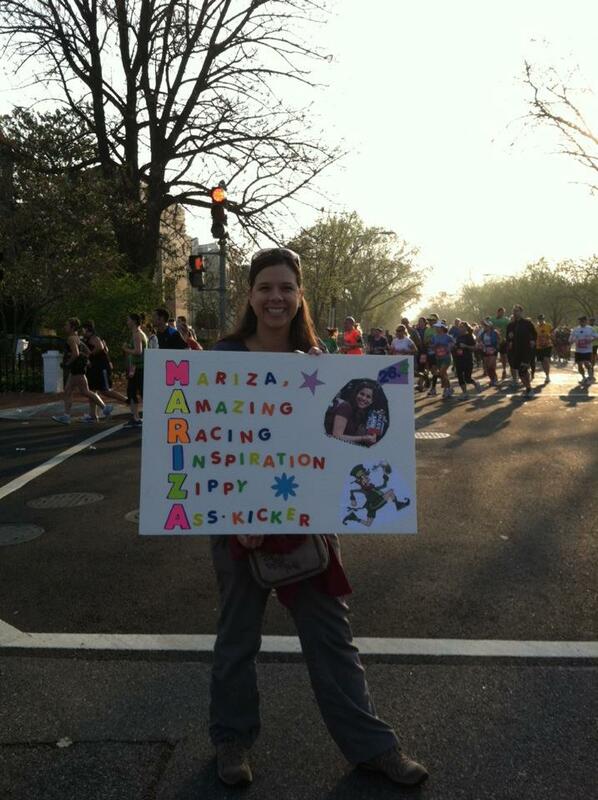 I thought of all the things that got me to mile 25 and all the people that supported me along the way. I thought of the people that couldn’t be there but would have been cheering me on anyways. The mile marker 26 sign was in full view and so were the crowds. People were cheering loudly…I saw my TNT team and got high-fives from them all. And there it was…the finish line. They called my name out on the loud speaker and I couldn't help but laugh and cry at the same time. I was finished! 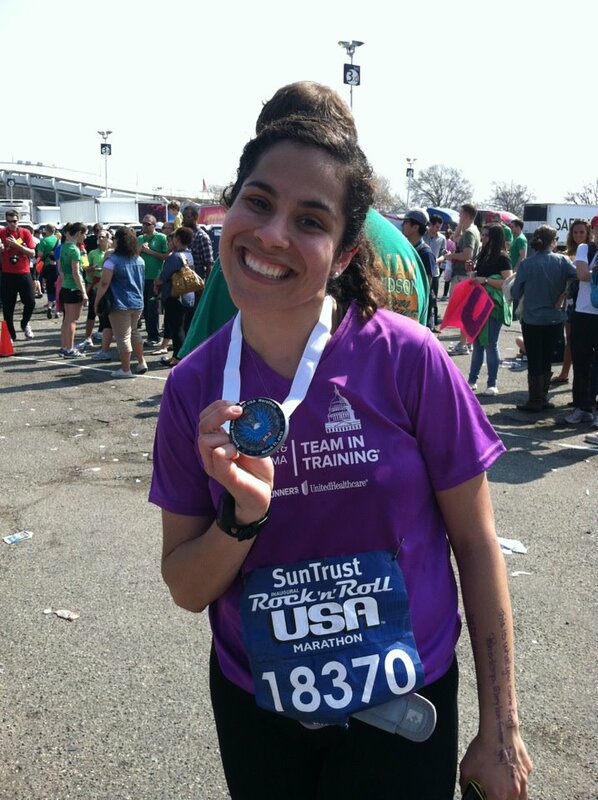 I actually completed a full marathon! It was an emotional moment for me. So much work and determination had lead up to the moment and for about 4.5 hours, I was able to forget about everything else in my life and focus on me and my running. It was the best feeling in the world and the runner’s high was certainly there. I took a second to collect myself, was given my finishers medal and quickly finished two bottles of water. There was a medic from the John Hopkins Medical team that walked over to me and for a second I thought he was going to tell me I didn’t really finish 26.2 miles and was going to ask for the medal back, but he came over to ask how I could be smiling so big after running 26.2 miles. He said he had treated a lot of sick and sad looking people today and was so surprised to see someone smiling so big. So he let me keep my medal and congratulated me. Whew! Wow..what an amazing feeling. There is really nothing like it. Despite the length of this post, I don’t think I will ever be able to describe what Saturday meant to me. There are so many levels of accomplishment and triumph that finishing that race brought to me. 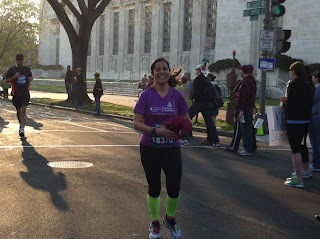 It was so much more than just running 26.2 miles, it was actually starting something, training for it, and despite the injuries, life distractions, and sense of doubt, I still did it. Me..the person that hates running! 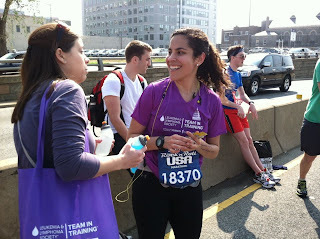 I am still in awe of what happened and while I know I can never recreate the feeling of completing my first marathon, I am eager to start training for my next race and accomplish whatever life puts in front of me next. The marathon was such a big part of my life for the past few months, so I am a bit sad it is all over and I don’t have an event sitting in the horizon, but I now walk a little bit taller knowing I am part of the small percentage of people that have ever completed a marathon. 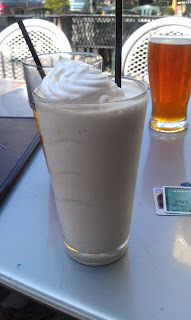 Oh, and I have to share with you my post race indulgant treat....Capitan Crunch Milk Shake...yes, it does exist and it is heaven in a glass...esp. after running 26.2 miles.